Jockey William Buick salutes the Newbury crowd after winning the Group One Al Shaqab Lockinge Stakes on Ribchester. Any meeting that yields a handful of clues and contenders for the upcoming Epsom Classics and the seasonal highlight that is Royal Ascot warrants the utmost respect. 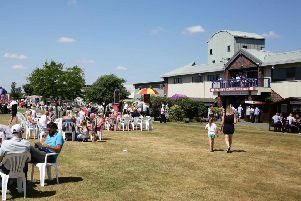 But the show at Newbury’s Al Shaqab Lockinge Day on Saturday was stolen by a member of last season’s Classic crop and a winner of last season’s royal shindig. For RIBCHESTER turned the highlight of the day, the Group One Lockinge itself, into a procession and, coinciding with the retirement of SOLOW, stamped himself as probably the best older miler in Europe at present. Much has been made of the apparent tactical botch-up involving designated pacemaker TOSCANINI that led to Richard Fahey’s 4yo making all. But I’m not so sure it was a botch-up at all. Indeed it has been interesting to read tributes since to a “Fahey masterclass” from some quarters. Certainly, the body language, on leaving the stalls, of jockeys William Buick on Ribchester and Fahey’s close friend, Paul Hanagan, on Toscanini did not suggest a plan that had gone wrong and needed rectifying. However the race unfolded, though, Ribchester was in irresistible form to thoroughly justify pre-race suspicions that he was the strongest of ‘good things’ so far this Flat season. Not only did the son of Iffraaj boast the best form on offer but also his fitness was guaranteed after a spin in Dubai, he was proven on the prevailing Soft ground and he had the perfect profile for the race, trends-wise. There was a case for him starting odds-on, rather than the 7/4 that was returned. Mind you, he was still a whole lot shorter than the 33/1 he could be backed at for last season’s Qipco 2,000 Guineas when, as a mere shell of a colt, he finished a surprise third. The relentless improvement he has made since that April day is reflected in his current imposing physique and also in the formbook, which will tell you that, after Saturday’s Lockinge, he has now reversed placings with the Guineas winner, GALILEO GOLD, on three occasions. Indeed it would have been four but for a luckless, strong-finishing effort in the Sussex Stakes at Goodwood. He is a horse with bags of speed, as Saturday showed, but also a genuine turn of foot, as last season’s Royal Ascot win in the Jersey Stakes showed. Also in his locker is a reservoir of resilience, as he displayed when coming back late at the mighty MINDING in last autumn’s QEII and indeed in the Lockinge when, after a brief scare as he hung right, he found more and powered home once grabbing the stand rail. Ribchester’s development is also a tribute to and triumph for Fahey, whose extraordinary rise as a trainer continues to dip under the radar of too many. I remember, some 20 years ago, when he was just starting out, sitting in the bar of the Rutland Arms Hotel on Newmarket High Street and, rather rudely, listening in on a conversation he was having with an associate. It was clear even then and even to my untrained ear that here was a wily, shrewd, but commonsense, operator destined for success. the Lockinge was his seventh Group One prize among more than 30 Group victories in total. Expect number eight when Ribchester returns to Ascot next month for the Queen Anne Stakes. Ascot will also be the destination for several other horses to advertise their talents at Newbury on a card that continues to grow in stature, thanks to the financial investment of Al Shaqab Racing. Indeed the sponsors themselves got a return for their money in the shape of precocious juvenile DENAAR, who won the Olympic Glory Conditions Stakes. Jockey Frankie Dettori said Richard Hannon’s colt reminded him of last year’s winner in the same colours, MEHMAS, who went on to become one of 2016’s best 2yos before he was controversially shipped off to stud. I wonder if he also reminded him of Fatefully, one of his ‘Magnificent Seven’ winners at Ascot back in 1996 because this colt’s dam is a half-sister to that horse. Not far behind Denaar was Clive Cox’s KODITIME, of whom I’m sure we can expect much better in time, maybe in a race like the Windsor Castle Stakes at Royal Ascot. He travelled sweetly before floundering in the testing ground when push came to shove. It was a similar story with the likes of CENTURY DREAM, in the London Gold Cup Handicap, and ALJEZEERA, in the Haras de Bouqetot Fillies’ Trial. Both can win races on quicker ground. In contrast, the Soft surface was very much to the liking of 2016 Coral-Eclipse hero HAWKBILL, who took advantage of a drop in class to return to form in the Al Rayyan (Aston Park) Stakes, and also DEFOE, a stoutly-bred colt trained by Roger Varian who looks sure to mature into a smart stayer on the evidence of his gutsy success in that London Gold Cup. Aside from Ribchester, the performance of the day, however, was delivered by NATAVIA, who quickened and forged clear to hose up in the Fillies’ Trial. Roger Charlton’s charge, owned by Khalid Abdullah, confirmed the promise she hinted at on debut at Newmarket’s Craven Meeting and would not look out of place in next week’s Investec Oaks if connections chose to take that route.